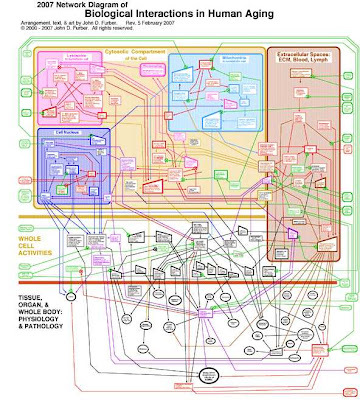 Created by John D. Furber at Legendary Pharmaceuticals, this is a visual representation of the biology behind aging using a network diagram. A large format image is available for printing here. John D. Furber of Legendary Pharmaceuticals has put together a visual model of aging referred to as 'The 2007 Network of Biological Interactions in Human Aging' that shows the interactions between various subcellular, cellular, extracellular matrix and organ system. This is a great representation of aging as it demonstrates no root cause but rather a network of problem areas that are interlinked. The goal of systems biology would be to flush this out in great detail allowing one to zoom in down to the specific genomic and proteomic components of aging. Systems biology would also pursue such a model to have a functional runtime component to it such that variables could be tweaked and changes introduced to predict impact elsewhere in the various biological networks. 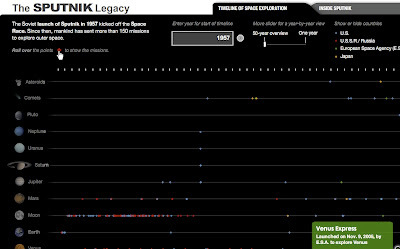 Newsweek has a cool interactive timeline showing all of the 150+ missions sent into space. Its organized by year (of course) but also by object of destination (planet/moon/asteroid). You can click on a year and zoom in to see specific dates of each launch. Rolling your mouse over any dot gives you the name and details of the mission. 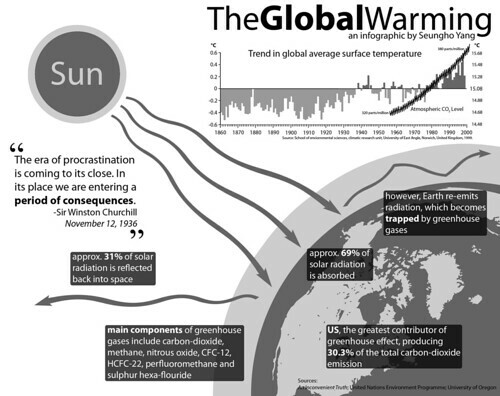 TheGlobalWarming Infographic, originally uploaded by Seungho. Found on Flickr by Seungho. I caught this on Digg, it's a map from civicactions.com. There's some good debate in the comments on Digg about the accuracy of the map. 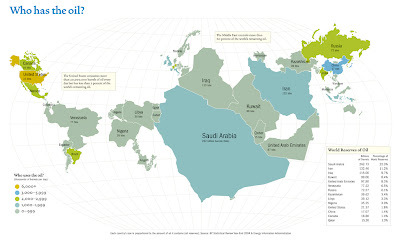 The size of the country represents the relative amount of oil reserves in each country, and teh color of the country represents how much oil is consumed by that country. From the University of Sydney, Bachelor of Design Computing website, See My Voice was a project by one of the students in the program, Andrea Lau. SeeMyVoice - Social Information/Data Visualisation (or infovis). SeeMyVoice visualises chat transcripts stored by MSN Messenger. It aims to highlight people's style of chatting and increase understanding of our online social interaction. Each person is represented by a coloured wave which ebbs and fluctuates according to message length and the time taken between messages. Great job Andrea! That's exactly how IM conversations go. UPDATE: Andrea has a complete website describing her work and the See My Voice project in much more detail. 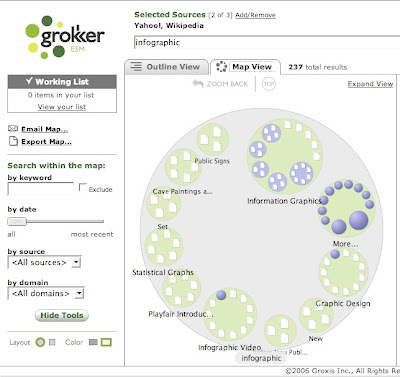 It's not new, but Grokker does a good job of searching multiple sites and mapping the data back to the user in visual form. ...a web-based enterprise search management platform that leverages the power of federated content access and visualization to maximize the value of information assets for enterprises, content publishers, libraries and other research-intensive organizations. 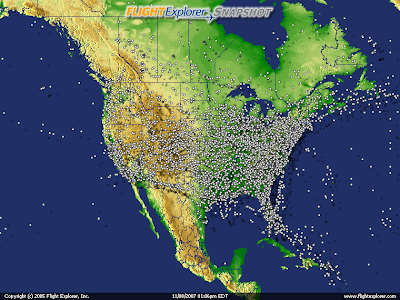 On the NATCA (National Air Traffic Controllers Association) website is this U.S. map showing every airline flight currently in the air. The information is delayed by 5 minutes. Also, the graphic isn't interactive, so you can see any information about the dots (like which flight it is). 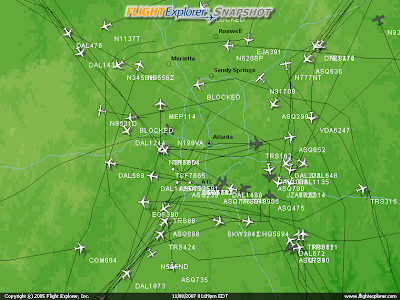 You can also zoom into nine select cities to see the flights in the air and the flight numbers. So the next time you're lying in the grass with your kids (in one of the major cities) looking up at the sky, you could (if you wanted to) figure out where that airplane is going. 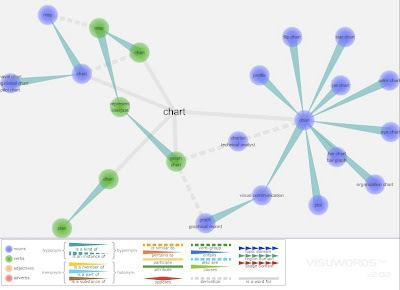 Visuwords is a new website that visually shows the relationships between words. More than an online dictionary or thesaurus. The relationships are shown graphically like a mind-map. Found on Uswim, a French company developed an ad campaign around the infographic video style we saw in the Royksopp video. It had such an impact that a few years later Areva, the French nuclear giant, wanted to use it for their advertising. Being denied it by the Norwegian pop group they finally went for the hit "Funky Town" on a video that looks very similar (as it was done by the same French art collectif H5 that did Royksopp's video). I found the link to Uswim on Simple Complexity. 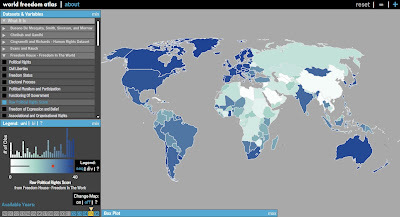 The World Freedom Atlas, offers many different views of the world. Developed by Zachary Forest Johnson, his blog is here. The one above is the Raw Political Rights Score (darker is better) based on data from the Freedom House. Offering a bunch of datasets from a number of different sources, the interface is fantastically easy to use. Depending on the dataset, you can also view the data by year from 1990-2006. Found on Digg, a quick graphic showing the massive entourage that travels with the President.